In Equilibrio get the ball to the exit to finish the level. To move the ball you have to tilt the playfield. Hold the Wii Remote controller horizontally. Tilt it and the playfield will move. 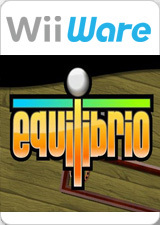 You can also play using the Wii Balance Board (sold separately with Wii Fit). The ball is fragile; don't let it fall too far. Don't touch deadly obstacles like spikes or acid pools. Will you be tough enough to complete all 64 levels? You also have 25 goals to accomplish. Completing them will increase your progress percentage. The difficulty of the game adjusts itself according to your skill. You'll come across special balls. Their behavior will be explained during the game. Some balls are more fragile than others. Each level has its own high scores. Try to be first on each one! The graph below charts the compatibility with Equilibrio since Dolphin's 2.0 release, listing revisions only where a compatibility change occurred. This page was last edited on 14 January 2018, at 08:19.